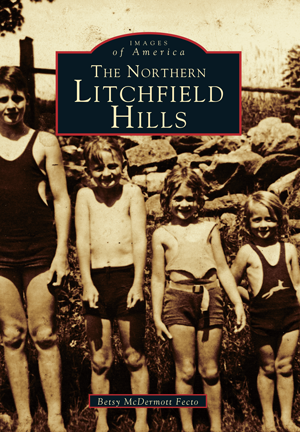 This wonderful visual history weaves together more than two hundred images with intriguing and informative text to create an immensely enjoyable journey through the history of the northern Litchfield Hills. The Litchfield Hills Region, situated in the northwestern corner of Connecticut, is known for its picture-perfect rolling hills, its traditional farms, and its charming villages. There is a sense of peacefulness and pride here, and yet this idyllic appearance belies a long and fascinating history dating back to the very first years of settlement in America. The Litchfield Hills Region has been home to such legendary figures as Harriet Beecher Stowe, Ethan Allen, and Oliver Wolcott, and in this book the contributions of these historic figures are celebrated alongside those of the ordinary folk of Torrington, Winsted, Litchfield, Kent, Sharon, Lakeville, Salisbury, Cornwall, Canaan, Canton, Collinsville, New Hartford, Riverton-Barkhamsted, Colebrook, and Morris. Betsy McDermott Fecto, a native of the Litchfield Hills, has combined images from a great variety of local sources with an eye for social and cultural history to create this compelling journey into the history of the northern Litchfield Hills. We are made to laugh, cry, reflect, and reminisce as we learn of the rich heritage of this beautiful area and realize that some things have not changed: that the Yankee spirit and values that made this beautiful part of Connecticut famous have been passed down through the generations and continue to this very day.